The weather’s brilliant for Italian watchmaker Panerai’s fifth annual weekend sailing with the Corinthian Classic Yacht Regatta in picturesque Marblehead, Massachusetts: the skies blue, the winds gentle but resilient enough at about 8 knots. Our guide today is Dudley Welch, a gracious, good-humored man with his own wind-powered sailboat called Jubilee. He spots a friend on the water and waves, calling out: “I’ve gone to the dark side!” He’s joking, of course, but the sentiment seems to ring true around these parts—“the dark side” refers to the motor powering our boat. There’s an unavoidable passion here for boats fueled only by wits, sails, ropes, and wind. The captain of our ship revs the engine and within just a few minutes, we’ve caught up to and passed by most of the boats on the race course, which is kept secret until just moments before gunfire signals the regatta’s start. It’s hard not to get romantic about a yacht race when it’s a “Panerai day” and you’re just meters from a startling variety of vintage and classic sailboats. 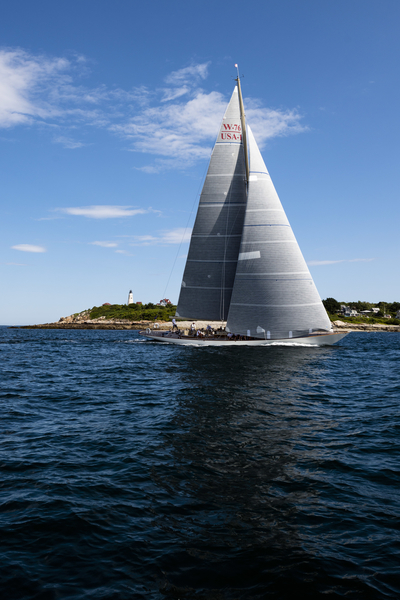 Valiant, at 64′ with a crew of approximately 15, strikes an almost fearsome attitude with its massive black carbon fiber sails. Others are frankly tiny—the 110 class boats fit at most a crew of three. I spy a few such adventurers out there, clinging—to my inexperienced eyes—in a precarious manner to the exterior of their ships, using their own bodyweight as a counterbalance against the force of the sea. So how on earth are there so many different kinds of boats competing against each other? 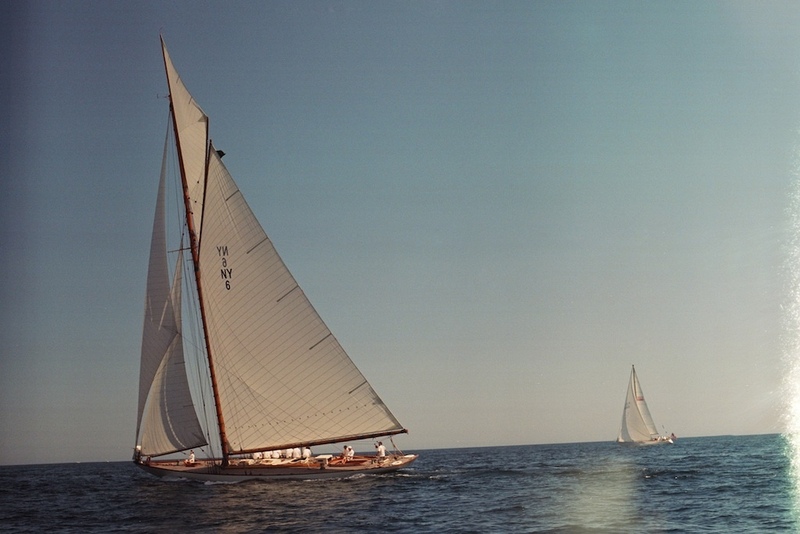 Panerai, devoted to keeping the spirit of classic sailing alive, has invited a wide variety of boats to race, some of them historic creations that have been meticulously restored; others a kind of boat called “Spirit of Tradition,” which above the water line are authentic to their time (perhaps the 1920s or 30s), but below, have been refined with modern equipment. The regatta in Marblehead is what’s known as a pursuit race. Whichever boat reaches the finish line first wins—but not all boats depart the starting line at the same time. The regulations have been changed for 2014—this year, boats with similar physical specifications have been grouped together into categories: Grand Classics (large vessels), Corinthian Classics (medium vessels), Day Racers (smaller vessels), and Grand Prix (Spirit of Tradition and performance modified classics). The boats determined to be slowest start first. On our spectator boat, there’s no music playing, but we do have a soundtrack—out of the radio spills a narrated countdown leading up to each boat’s starting time. Our captain steers us very close to the action. It’s a nail-biter. At one point, a boat favored to win misses the mark and loses precious time turning around to do it again. Later, a boat’s sails crinkle right next to us (a sign they haven’t been pulled taut enough for these conditions). The deflating fabric crashes dramatically in the wind. The regatta takes place in two phases over the weekend. On Saturday, the course is upwind toward Gloucester, which provides a good tactical first leg. Sunday’s course sends the competitors on a reach toward Nahant and back, with the fleet tightly making turns around the markers, testing the prowess of the skippers and crews. Sunday evening, the awards ceremony is held at the Cornithian Yacht Club. From start to finish, the ceremony is a heartwarming display of the kind of camaraderie so cherished by Donald. Everyone cheers on everyone else. Many of the trophies have been hand-carved by Bruce Dyson, Vice Commodore of the Eastern Yacht Club. Spartan, a 72′ NY 50 owned by Victor Paul, is called up again and again, and takes first place in the Grand Classic Division, which with just two boats is the smallest class. Cara Mia, a 43.5′ NY 30 owned by Alfred Slanetz, earns first in the Corinthian Classic Division. Good Foot, owned by Ross Weene and Eli Slater, is one those small 110 boats at just 24′ and ranks first among the Day Racers. Donald’s Wild Horses is first among eight other boats in the largest division, the Grand Prix. 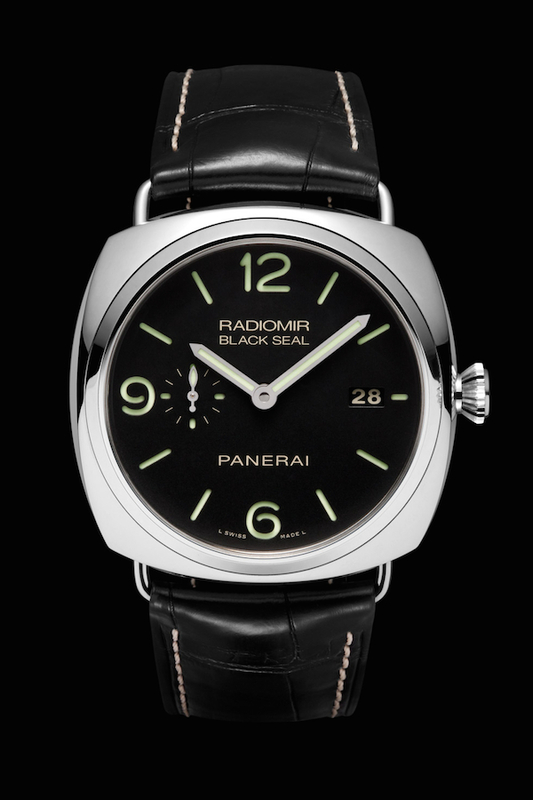 Of course, the most coveted prize is a Panerai Radiomir Black Seal 3 Days Automatic (PAM 00388), to be presented to the regatta’s Best Overall Winner: Wild Horses. Donald shakes the hand of Corinthinian Yacht Club’s Commodore Ken Adam and Panerai’s representative Michele Gallagher with tears in his eyes. “It took me 10 years to win this,” he says. 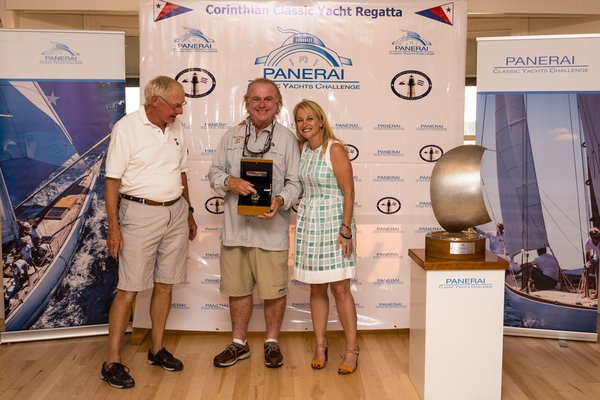 Donald has been participating in the Panerai Corinthian Yacht Club Classic essentially since the beginning, and he’s been sailing and racing since he was six years old, when his father came down one weekend with a big cardboard box strapped to the roof of his car. Inside it, there was the jangle of cut plywood and little brass screws: an Alcort Sailfish kit. With Donald’s family, he put together the 12′ boat in just a couple of weeks. Six years later—against the wishes of his father—Donald bought and built a 14′ Super Sailfish from another Alcort kit, to get a little more speed out on the water. It was 1959. The kit cost him every last penny he had: $482. Clearly, he’d gotten the racing bug. And it stuck with him: After twenty-five years in the commercial real estate business, Donald sold off the company in 1997 to sail full time, as well as build and sell boats with the W-Class Yacht Company. Wild Horses is one of the most treasured W-Class vessels, a spirited descendant of the swiftest boats of the early 20th Century. It was designed by Joel White, son of acclaimed writer E.B. White, who authored the beloved Charlotte’s Web and The Elements of Style (with William Strunk, Jr.). “I wrote my senior high school AP thesis on the essays of E.B. White, and have all the books he ever wrote,” says Donald. 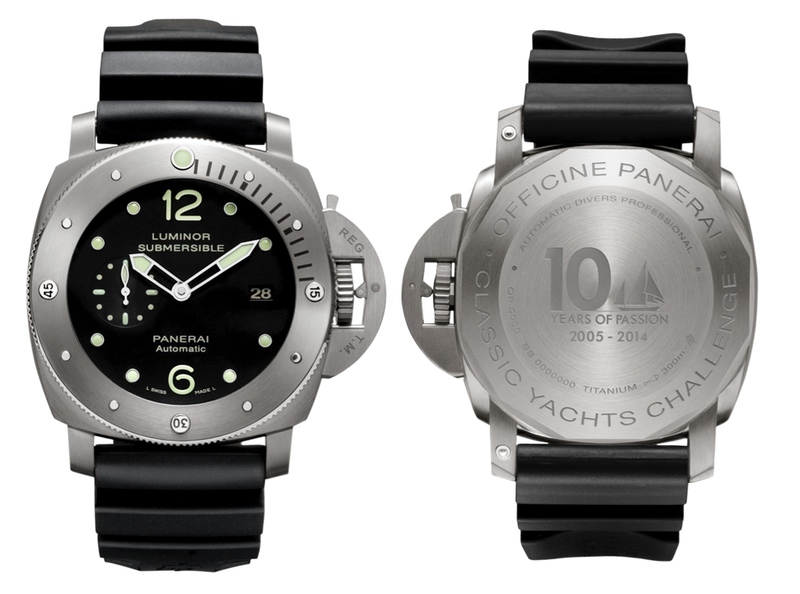 2014 marks “10 Years of Passion” for classic sailing from Panerai, which has long been an authentically nautical brand, with roots in the Italian navy and an array of finely crafted submersible watches well-suited to the atmosphere of places like colonial Marblehead, with a history rooted in fishing and racing. 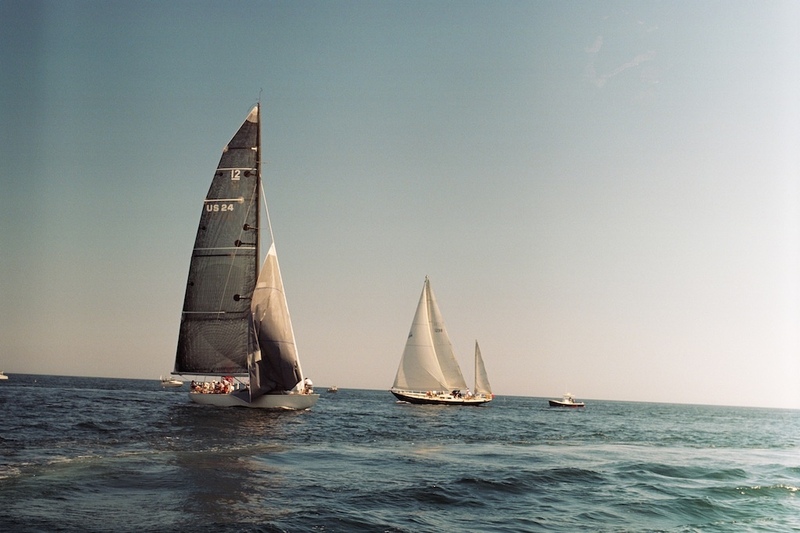 Marblehead’s first regatta took place in 1845, and there’s a lively community to be found at any of Marblehead’s Boston, Eastern, and Corinthian Yacht Clubs. To celebrate, Panerai will introduce the commemorative Luminor Submersible 1950 3 Days Automatic Titanio – 47 MM (PAM 00571). The limited edition watch features a commemorative case back and the brand’s in-house P.9000 movement. Its screw-down back and crown guard lever make it water-resistant to 300 meters, while a unidirectional rotating bezel allows wearers to time their dives. And the partly-skeletonized, luminescent hands guarantee excellent visibility even in very deep water. The Marblehead race, which took place August 11-12, was just the beginning of the Panerai Classic Yachts Challenge – North American Circuit. It continued to Nantucket this past weekend for the 42nd edition of the Opera House Cup (overall winner: Goshawk captained by Wendy Schmidt took the Panerai watch, and Sumurun, skippered by Buzz Goodall, won the Opera House Cup), and will be followed by the Museum of Yachting Classic Regatta, held every year in Donald’s home base of Newport, Rhode Island over Labor Day weekend. That Sunday, Panerai North American President Rafael Alvarez will present the Panerai titanium sculpted sail trophy to the Best Overall winner of the three-part circuit.